When Richard Brodeur was establishing himself as the sole reason why the Vancouver Canucks made it all the way to the Stanley Cup final in 1982, his teammates had no idea of the lifelong passion he was harbouring. Perhaps one or two close friends may have been told, in a quiet moment over a libation on the road, but generally speaking none of his teammates had the slightest idea the club’s No. 1 goalie loved painting from a very young age, and would one day become one of the more successful painters in the country. “In art class at school the teacher used to tell me, ‘Richard, you’re very good at this,’ and I always enjoyed it,” says Brodeur, who was also immersed in hockey at a time when a desire to express himself this way wouldn’t have been understood nearly as well as it would today. Brodeur took it from there, painting at home, but never letting it be known while he was becoming “King Richard” and a Canucks legend. At the time, he hadn’t the slightest idea the paintings would sell as well as they do now at the Birthplace of B.C. Gallery in Fort Langley, the exclusive distributors of his work. To this day, many of Brodeur’s old teammates have no idea the amount of money his paintings fetch, and how well known he’s become for them. Brodeur now accepts commissions for clients who envision certain scenes, hockey sweaters, or particular rinks from across the country, and the demand is significant. Needless to say, this keeps him very much a celebrity in this town, his willingness to sign and dedicate his paintings, while chatting with customers, further endearing him to his new fans. His play during the ’82 Cup run was beyond a dream as well, the little goalie fashioning one of the best playoffs in goaltending history, albeit in a losing cause. In the semifinal series against Chicago Brodeur was literally pelted with pucks with Denis Savard — in his prime, twisting and weaving effortlessly through the Canucks defence to get scoring chances or set up linemates — in the three games at the old Chicago Stadium. Brodeur easily rebuked 20 great scoring chances a night. It had to be seen to be believed how a guy with seemingly relatively little athletic ability could play the position so well. He was unforgettable to any Canucks fan who saw those games. Now, through his second line of work and his lifelong passion, he’s certain to be genuinely unforgettable to another sort of fan. This entry was posted in Birthplace of B.C. 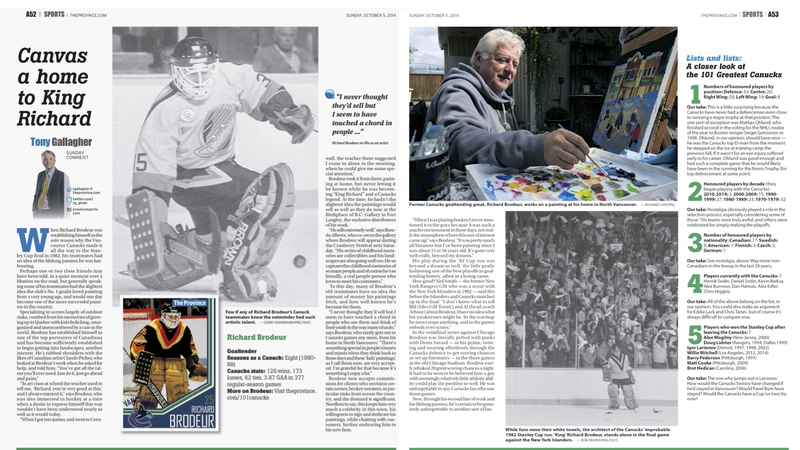 Gallery, Gallery Artists in the news, King Richard Brodeur, The Art of Sports and tagged Richard Brodeur, Tony Gallagher, Vancouver Canucks. Bookmark the permalink.